It is the second day of the U.S. Open so let’s highlight some special people! It’s that time of year again in Flushing Meadows. Many fans have been anxiously awaiting these glorious two weeks in NYC where at any given moment you can see some of the best players in modern day tennis on any given court. We have seen some interesting performances as of late with our top players. Djokovic claimed his third Wimbledon 2015 title beating Federer in a four set match, but then we saw a comeback with Federer as he claimed his seventh Western and Southern crown in Cincinnati in the finals against Djokovic. It’s hard to say what the outcome will be for the 2015 U.S. Open, but I would have to hedge my bets that either Djokovic or Federer will be taking home that trophy. This will be Federer’s 16th U.S. Open start and his 64th consecutive Grand Slam Tournament appearance! That’s quite a record, but let’s not forget to look at our other players that have really proven great successes over the years. For example, Murray who comes in after winning his 35th career title at the ATP Masters 1000 event in Montreal and who lost in the semi-finals against Djokovic in Cincinnati. He has a powerful game and can put up a good fight against our top two players, Federer and Djokovic. He has even beaten Federer a few times, but never in a Grand Slam. Finally, someone who is very much worth mentioning on the men’s side, is John Isner. I have blogged about him before, but would like to speak briefly on him again, especially since the Bouncing Bunch is native to GA and John Isner attended our very own UGA. Go Dawgs! Isner, is a top American ranked no. 13 in the world. I’d say that is definitely worth mentioning and he just won his 10th career ATP World Tour title here in good ol’ Atlanta! Now to the Women of the U.S. Open…. Before going into the women’s highlights, we wanted to take a minute to talk about someone special to us. The Bouncing Bunch has several dear friends that are tennis players, and one of them is South Africa’s Chanelle (Chani) Scheepers. She has recently announced her retirement from Professional Tennis and we at Bouncing Bunch wanted to give her a shout out for being such an awesome tennis player! We love you, Chani! 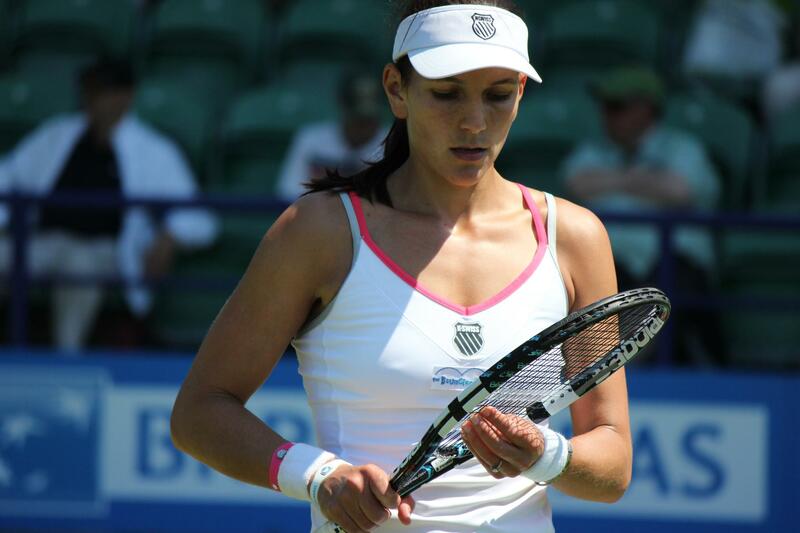 On a side note, she is still very much involved in tennis, however, and you can follow her @ChaniScheepers. Following the second day of the 2015 women’s U.S. Open, Serena Williams comes out strong once again, overtaking 25 year old Russian, Diatchenko. If I had to bet on this tournament, I would probably say there is a strong chance that Serena will be taking home the trophy as the competition has proven to not be as strong this year, with no. 3 ranked Sharapova withdrawing from the tournament the eve of the opening due to an injury. Serena’s sister Venus, has advanced to the second round as well, beating Monica Puig. This is only Venus’ second victory since losing in the last 16 at Wimbledon. We would love to hear your feedback on the U.S. Open. Who do you think will be in the top 3? Lastly, we wanted to part with a picture of our very own Chani Scheepers rocking the Bouncing Bunch logo at a Grand Slam Tourny before her retirement! ← Curious about finding the right youth sports program for your child?